People with nearsightedness, or myopia, usually have difficulty seeing far objects. In severe cases, they can have trouble seeing objects both far and near. 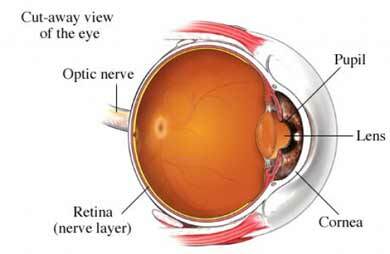 Nearsightedness is a type of refractive error. This means the shape of the eye does not bend light correctly, so images are blurred. This usually occurs with an eyeball that is longer or a cornea that is steeper than normal. It may also indicate variations in blood sugar levels in people with diabetes or developing cataract. It may also be temporary after long periods of close-up work when the eyes have trouble refocusing. Nearsightedness is more likely to occur in people who have family members with the same condition. Although the evidence is conflicting, some specialists believe that chronic near work, such as prolonged periods of reading or the daily use of a computer may also increase your chance of developing nearsightedness. A vision specialist will ask about your symptoms and medical history. You will be given an eye exam to determine if lenses will help improve your vision. Nearsightedness can be treated using corrective lenses, such as eyeglasses or contact lenses. You will have appointments at regular intervals to assess your vision and determine if your corrective lenses prescription needs to change. If you elect to undergo the procedure, certain forms of nearsightedness may be treated with refractive surgery. The surgeries used to treat nearsightedness focus on changing the shape of the cornrea to increase the eye's ability to focus. Many of these procedures are done using lasers, such as LASIK or photorefractive keratectomy. Corneal refractive therapy, also called orthokeratology, uses a series of hard contact lenses to flatten the cornea over time. When the contact lenses are worn, they eliminate the nearsightedness. However, it is not a permanent solution. If you stop using the contact lenses, the nearsightedness returns as the cornea returns to its original shape. In some situations, removing your native lens and replacing it with an intraocular lens can help treat nearsightedness. There are no current guidelines to prevent nearsightedness. Durrie DS, Vande Garde TL. LASIK enhancements. Int Ophthalmol Clin. 2000; 40:103. Gimbel HV, Penno EE, et al. Incidence and management of intraoperative and early postoperative complications in 1000 consecutive laser in situ keratomileusis cases. Ophthalmology. 1998;105:1839. Myopia (nearsightedness). American Optometric Association website. Available at: http://www.aoa.org/patients-and-public/eye-and-vision-problems/glossary-of-eye-and-vision-conditions/myopia. Accessed February 12, 2018. Nearsightedness: Myopia treatment. American Academy of Ophthalmology website. Available at: http://www.geteyesmart.org/eyesmart/diseases/myopia-treatment.cfm. Accessed February 18, 2016. Shortt AJ, Bunce C, Allan BD. Evidence for superior efficacy and safety of LASIK over photorefractive keratectomy for correction of myopia (Review). Ophthalmology. 2006 Nov;113(11):1897-908. Yoo SH, Azar DT. Laser in situ keratomileusis for the treatment of myopia. Int Ophthalmol Clin.1999;39:37.